Caramagna is a small suburb of Imperia from which the hinterland as well as the coastal towns are easily reached due to its central location. You can undertake relaxed walks as well as physically strenuous hiking trips from Caramagna to the hinterland. Also villages like the not so distant Dolcedo, promise the holiday makers a memorable experience and encourage them to undertake cycling tours. Pista Ciclabile is also not far from Caramagna. As soon you reach it, you can cycle along the coast without a hurdle and enjoy the fantastic view. The two localities of Imperia, Oneglia and Porto Maurizio, are easy to reach. These are very attractive, with all kinds of beautiful sand, pebble, and rock beaches, which are ideal for bathing and water sports, as well as romantic lanes, shopping opportunities, restaurants, cafes and everything that a tourist’s heart can possibly yearn for. Caramagna does not only have an extremely favorable location, which makes it possible to undertake tours into the surrounding region, but rather it also has something of its own to offer. It has shops, a supermarket, typical bars and a pizzeria with a beer garden. Evening entertainment, especially in the summer months, is also catered for. On the play ground, the Ligurian feast with music entices one to step up for a dance. No holiday-maker should miss such an evening! Caramagna is part of the big coastal town of Imperia. Caramagna is particularly attractive owing to its central location between town and hinterland. The favourable location of the village makes it possible to reach the hinterland within only a few minutes, just like the coast of Imperia. The village was already inhabited since early times, and was integrated into the municipality of Imperia in the 12th century. Caramagna was involved in the feud, which prevailed between the various localities in Imperia. It was not until the setting up of a joint town council in the municipality that it became possible to end the hostility in 1923. 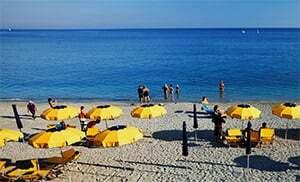 Caramagna belongs to the municpality of Imperia and is a village in Imperia province which lies in the Liguria region. There are several other villages near Caramagna, for example: Dolcedo (5.1 km), Isolalunga (4.5 km) and Torrazza (8 km). From Genoa take the Imperia Ovest highway exit. Follow the Via Tommaso Littardi up to Str. La Colla, then SP41 and Via Caramagna up to Via Moltedo.